Each MCTA Scholarship applicant must be a Maine resident, must have completed high school and have a need for financial aid. Applicant should have work experience on a Christmas tree farm or whose family is a current MCTA member in good standing. Preference is given to those who have been involved in the industry in some form and/or those interested in a career in natural resources. At least one scholarship is offered each year, and will be awarded only once per person. 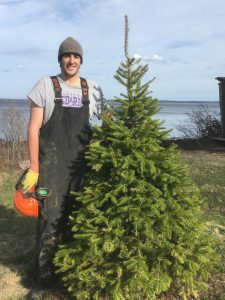 Scholarship will be awarded at the Maine Christmas Tree Association winter meeting each January. Evidence of acceptance or enrollment in a two-year or four-year college or university. Scholarship may be awarded to a high school senior who lacks such evidence. However, funds will be withheld until evidence is presented. Complete the application and write a letter of intent to the scholarship committee. The letter should explain why you are applying, your interest in the industry, your financial problems (if any), prior experience, and career goals. A letter of recommendation from a member (not a family member) of the MCTA would be helpful. Application downloadable here, or available in your school guidance office or by contacting the Maine Christmas Tree Association, c/o Joanne Bond, 174 Bond Springs Rd, West Newfield, ME 04095, (207) 793-4658. Applications must be filed by October 1st of each year.